Well, the year itself wasn't unexpected but much of what happened was. The first part of the year actually went pretty much according to plan, maybe too smoothly. 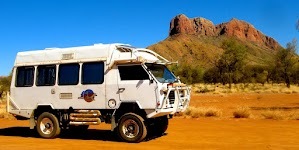 There was the usual Australia Day BBQ followed by a hot summer, then a phase of repairing and upgrading the Oka in preparation for another outback trek, this time across Western Australia. Read on because it didn't happen that way. 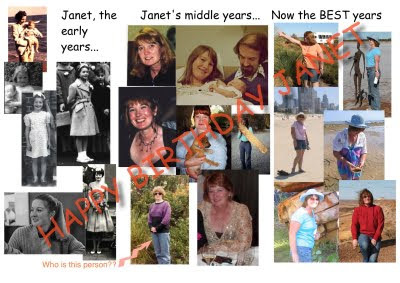 By popular demand, Janet's birthday had been deferred for several months, since we'd only just returned from a 14,000 km trek, and we eventually held a commemoration in conjunction with an Australia Day BBQ on, well, Australia Day. Interestingly, in a snap poll of the 20 or so people present, only one had actually been born in Australia. Quite what that meant in the context of our Australia Day celebrations we didn't pursue, due to too many non-functioning brain cells. But it was also Chinese New Year's day so, in true Aussie style, anything is worth celebrating if it has, as its basis, the legal consumption of alcohol. 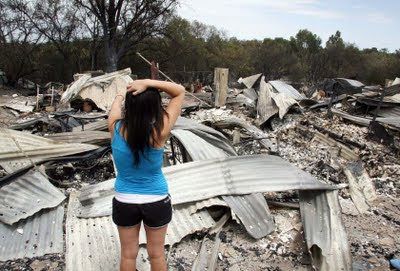 Severe bush fires in Victoria took up most peoples attention in February with 173 people killed and thousands of homes and lives destroyed. The answer is no one could. It was an unstoppable ball of fire, a pyroclastic cloud consuming everything in its path and killing by radiant heat alone until nature took a hand, and the picture below shows the sad result for so many people. 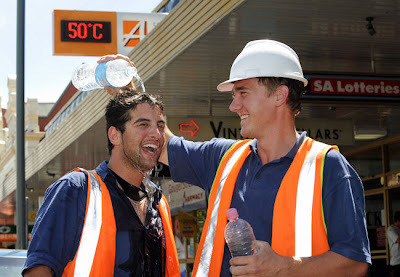 The heat was tremendous with many towns recording 48º temperatures. 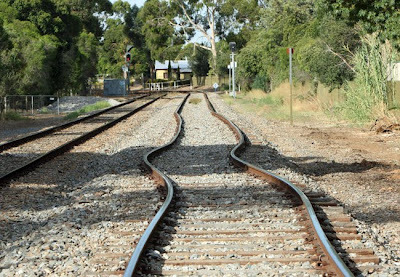 In Adelaide it officially reached 46º, or 115ºF on the old scale, and railway lines buckled in the heat. On the streets and at the beach it exceeded 50º. 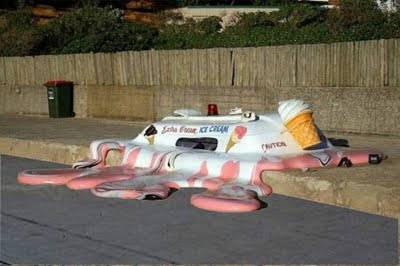 There were a few lighter moments though, this sculpture of a melted ice cream truck says it all about our long hot summer. We went and had a look at the lower lakes region after many years of severe drought and water shortages. It's more than 7 years since the River Murray actually reached the sea and Lake Alexandrina has become a sandy basin fit only for land yachting. After the summer we were planning to "do" the Connie Sue and Gunbarrel Highways in outback WA (around 2,000 km of rough outback tracks for those who are not familiar with them), and out to the west coast for some sea breezes. But it didn't quite happen that way. We had a quintille of problems which kept us at home until late in the year. First I had a health scare when the doctor found a small lump on my prostate following my normal annual check-up. That required a biopsy, which confirmed a small amount of cancer, followed by a full day of x-rays, MRI's and bone scans to determine its extent. Fortunately it is under control for the time being, not life threatening and hasn't spread, and even if it does grow, there are surgical solutions to control it. The worst they found was a gall stone which shone out like a super-nova on the x-rays, but nothing to worry about. But all this took a couple of anxious months to resolve. Then I found a broken tooth on the front differential gear of our Oka, (the opposite of a gall stone), which meant a complete strip down and rebuilding of the front axle. That's now finished and we are back on the road but it kept us busy for a few more weeks. All good experience and I've written it up on our blog here. Then, just as we finished with that, our dog Bella had to have a large cancerous lump removed from her leg and it all took around 3 months for the wound and skin grafts (not to mention my credit card) to heal, before we could lumber Mark and Mollie with looking after her while we were away. Poor Bella, looking just a bit sorry for herself after her skin graft operation. So we were stuck at home through the cold and wet winter (by Adelaide standards), all packed up and ready to go but couldn't leave. Very frustrating, but at least the vegie garden was blooming. We had a world record crop of broad beans (pity no one likes them except me), caulies, broccoli and beetroot and we managed to raise seeds from squash, pumpkins, sweetcorn, silver beet and tomatoes which are now all flourishing in the summer heat. Strawberries we grow too, but only for the birds and millipedes to eat. One of my long term friends and colleagues, Nigel, a jogger and non-smoker, succumbed to lung cancer and his funeral was both an enlightening but a very sober affair. Around 300 people turned out which was an indicator of his popularity. Then the car's automatic gearbox, which kept jumping out of gear and generally messing around at inconvenient moments, needed an overhaul. Luckily it only cost us a small fortune when I was expecting it to be a large one. Janet had been experiencing some thigh/hip pains but an ultrasound determined that they were caused by someone or other's syndrome and she needed some injections to regrease the joints, which have only been partially successful. Then in October, the solar hot water tank on the roof burst sending lots of hot water into the roof. Most of it went down the tiles and into the gutter but sufficient got though the tiles to cause the hall ceiling to sag in several places. Strangely, the smoke alarm in the hall went off at 2.30am (just when your brain is not awake at all) and it was raining. Janet felt some splashes on her leg so we assumed a bit of rain had got in but I don't understand how that set off the alarm. So we put a bucket under the drip, took the batteries out of the smoke alarm, stopped worrying about the technicalities involved and went back to bed. In the morning it was still dripping, the bucket was full, but the sun was shining and there was no sign of rain. It was then, being slow learners, that we realised that the tank on the roof was leaking and it got progressively worse as the day wore on. We had the tank replaced the next day (it was 20 years old so a "bit of a leak" was not unexpected), but getting the hall ceiling done was more problematic. The hot water caused the Gyproc panels to sag and potentially collapse so I had to prop them up pending finding someone to fix them. The sagging ceiling panels in the hall. Fortunately Mark's friend Heath is in the wall board/plastering business and he gave us a quote and the insurance covered the cost of the ceiling repair but not the tank. I did manage to install another antenna for our HF radio in our Oka. It's a 9 m high fibreglass telescopic whip antenna to enhance our communications abilities when we are remote from civilisation, which we seem to be most of the time. 9 m might seem a tad large compared with your average car radio aerial, but when it comes to HF radio transmissions, size definitely does matter. We do, however, have to maintain a keen watch out for thunderstorms as it could be attractive to lightning. In a thunderstorm, you don't want to be the tallest thing around. For the technically minded, 9 m happens to be a 1/4 wavelength on our primary communications frequency of 8.022 MHz which is the optimum length for effective transmission. 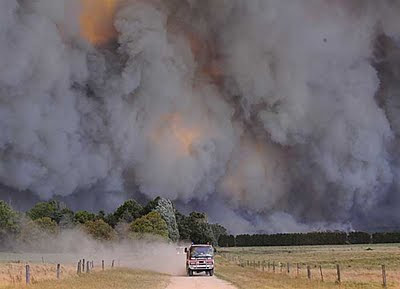 It can give us a communications range of up to 3,000 km, far enough to seek assistance from any part of Australia. 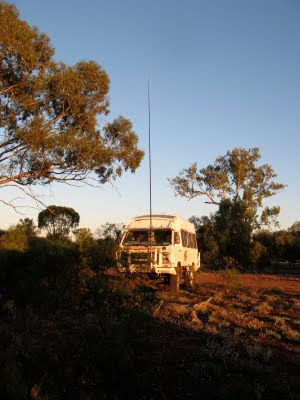 Our 9 m HF antenna raised in a bush camp at dawn somewhere in outback NSW. (Actually I know exactly where it was, and so I should with all the technology at our fingertips. It's location is S31' 33.72", E146' 55.19", which is 25 km west of Nyngan, in bushland about 1 km south of the Barrier Highway, across the railway line and left at the next bush). But despite all these dramas, none of them stopped us going up to Brisbane in November for Janet's cousin's twin daughters 40th birthday bash (I wish they were more closely related, it would save keystrokes). We left on 7 November and were away for about 4 weeks, getting back just in time to not miss all the Christmas silly season stuff. We had a really good time in Brissie, staying with Janet's cousin. The bash was a fancy dress party and I went as a Maharajah and Janet as a Maharini. If you don't want to see someone in a turban pole-dancing around a Hills Hoist, look away now. Janet and David in their Maharajah costumes. David a bit later on needing the support of a clothes hoist, and yes that is a snake up his sleeve. Who called the police? Oh, it's OK, he was the host in disguise. Before we left, our hosts shot off to Tassie for a few days leaving us in charge of their house, liquor supplies, BMW etc. Living in their house, driving their car and raiding their fridge felt like identity fraud. When we eventually dragged ourselves away, we had been gone 4 weeks and did 4500 km, which is a very long way for a birthday party. We would have been away longer but it was very hot and humid and you just can't do sight-seeing when it's over 40º. 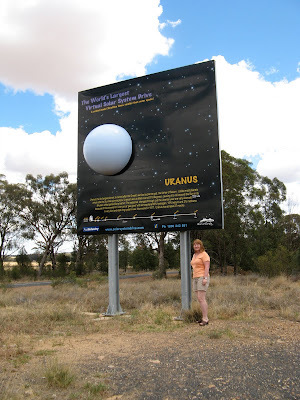 Part of the worlds largest Solar System Display, near the Warrumbungles National Park, around 100 km across, centred on the Siding Springs Observatory. As it was, we did do some 4WDriving in a rain forest in the Border Ranges National Park, where Janet collected a leech on her foot, a tick on her leg and saw a snake close up, too close in her opinion. We also visited our friends Tim and Brenda in Byron Bay on the way back, and returned across the Barrier Highway through some stunning desert scenery between Broken Hill and Cobar. A roadside stop in southern Queensland, (which is not between Broken Hill and Cobar). On the way to and from Brisbane (which is more than a week's drive each way), we stayed at a delightful free campsite alongside the Gwydir River in the town of Bingara, in northern NSW. The town's forward thinking council are actively attracting motorhomers to come and stay in the town for free, in the expectation (accurate as it happens) that they will patronise local businesses and keep the town alive and thriving. We fully support that kind of RV Friendly symbiotic environment. The Gwydir River campsite in Bingara. One of the other nice places we stopped at was Peterborough in the mid-north of South Australia. They have an excellent railway museum there with a round house, engines etc, but unfortunately no working locos at the moment. It's ironic that the main Trans-Australia railway passes through the town but you can't actually go there by train. I've asked them to fix that. What any small boy would want to do. Surprisingly, apart from all our dramas, all is well here. Global warming has deserted us for the time being after a record hot November and it's quite cool and gently raining. Not enough to water the garden but enough to rust the tools I left out last night. We've had an interesting if somewhat unexpected year and hopefully we can cope as well with whatever fate hands us next year. We remain forever grateful that our problems, however frustrating they may be, are trivial compared with the really serious issues that some our friends are having to deal with. We hope you have a really good Christmas break and good fortune in 2010.